Welcome to Crafting with Amy and the FCCB Vinyl EDU Cricut Crawl - Fantabulous Cricut's version of a Blog Hop!! This week we are challenging you to create a project using vinyl you have cut using your Cricut. 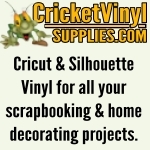 We have a fabulous sponsor, Cricket Vinyl Supplies . If we get 100 participants in this challenge, Cricket Vinyl Supplies will give away a Cricut Expression package that includes a Cricut Expression machine, deep cut blade, Jasmine Cricut cartridge, ten 12” x 12” assorted sheets of matte vinyl and one 12” x 12” gridded transfer tape. How exciting is that?? 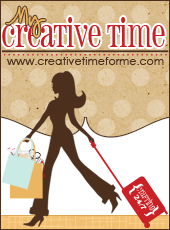 If you've come from Connie at http://www.conniecancrop.blogspot.com/, you're in the right place! If you've just happened across my blog and would like to see all the fabulous Design Team creations head on over to Fantabulous Cricut HERE to start at the beginning. Make sure to check out each DT member's blog! 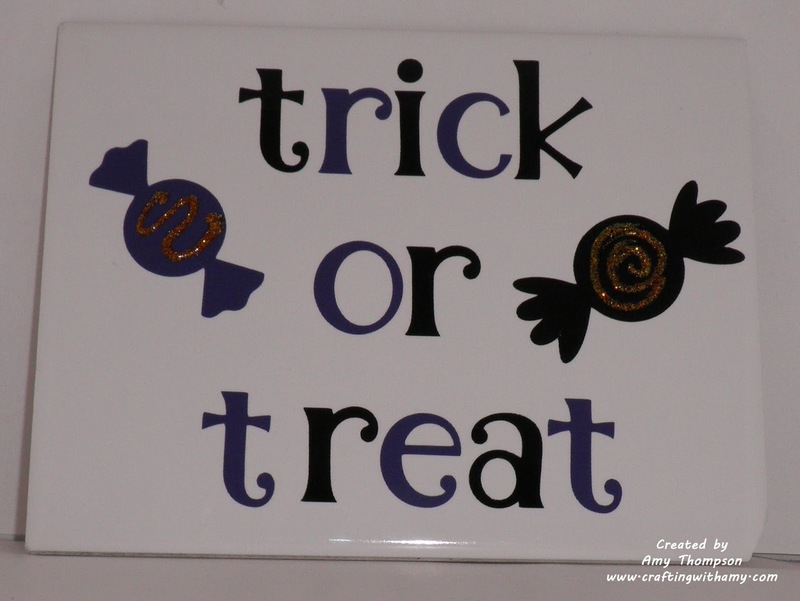 There will be Blog Candy along the way at ALL our DT members' blogs, and there will be a Grand Prize up for grabs at FCCB for one participant who submits a project using vinyl at FCCB! For my project..... I used some purple & black vinyl, Alphalicious Cricut cartridge for the letter and Celebrations Cricut cartridge for the candy. I then took some orange stickles on the candy. The vinyl is on a white 5x7 tile. I will be giving away a little blog candy so please leave me a comment and tell me what your favorite thing to make with vinyl is. I will be picking a winner on Monday September 16th at 10 pm PST and announce the winner on Tuesday September 17th. Your next stop is Missy at http://www.quickchickdesigns.blogspot.com/. Make sure to visit all the stops along the way and when you get done, make sure you link up your project to FCCB's Fantabulous Cricut Crawl post!! 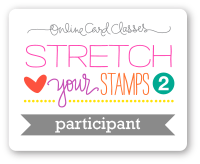 Would you like to win a Cricut Expressions Machine? If we get 100 participants in the challenge our sponsor will give away a cricut machine, including a deep cut blade, Jasmine cartridge and loads of vinyl.... so awesome, tell you friend to join this weeks challenge! The stickles on the candy is really clever! I've never used vinyl before so I can't answer your question. BUT I've received my order from Cricket Vinyl Supplies and can't wait to get started!! Fabulous! Love the stickles on the vinyl! Great idea to put vinyl on the tile! Lover your tile, Amy! So cute! 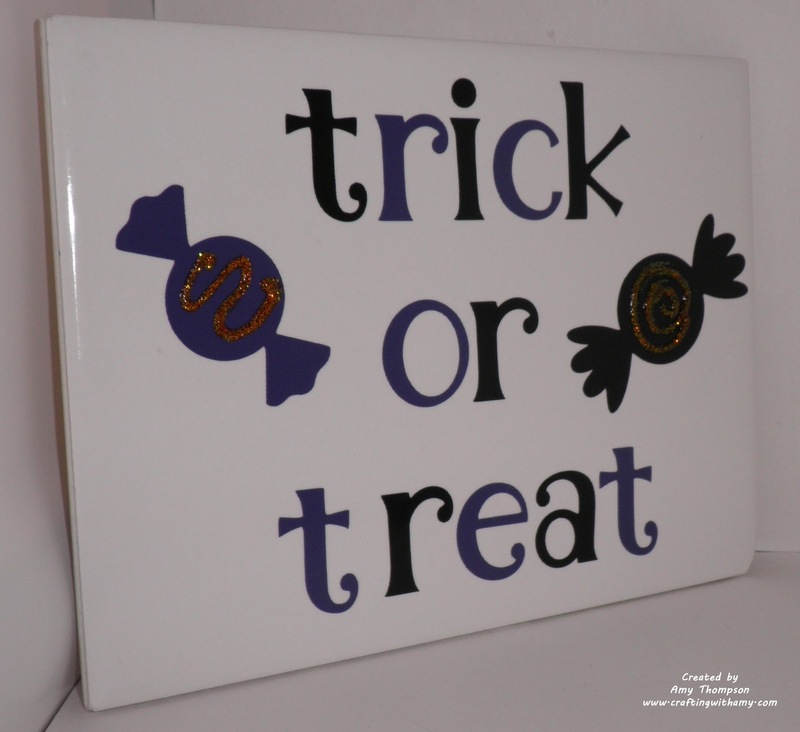 Like the tile w/ the vinyl Halloween decor. I have some vinyl and have just not given it a try on my Cricut yet but definitely will. My fav would be to make a tile like yours or decorate a jar. 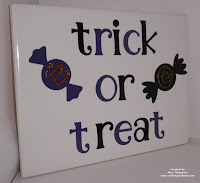 Such a fun Halloween tile, cute idea :) I'm lovin' these vinyl projects! Super tile! I really like the stickles you added, they're a great touch! Cute creation! I never would have thought of putting Stickles on vinyl. Great idea!! Awesome tile! Love how you added Stickles to the vinyl! Turned out so cute! Really cute project....my favorite thing to decorate with vinyl would have to be walls. Thanks for sharing and the chance to win blog candy!! Love the effect with the Stickles on the vinyl. How lovely of you to offer blog candy. I am new to this kind of project, so I have never made anything with vinyl before. You didn't require us to follow to be eligible for your drawing (which is sweet beyond words), but I am a brand-new follower by Google Blogger, nonetheless. Yippee!! I love this idea ! Such cute ways to decorate for the season !